I heard it takes 30 days minimum to get comfortable with vi. I'm on day 2 hehe. Right now, I seem to be merely memorizing different shortcuts for things I already did in Visual Studio (incremental search, prev/next word, etc.). So far the most powerful aspect seems to be the numeric keys combined with commands (5 * next line), and the idea of normal/insert modes. There are a few things I miss from Visual Studio. Ctrl-Click'ing the mouse for quick copy and pasting is probably the biggest. So that I don't get discouraged, can you guys walk me through some things in vi that you do regularly that can't be done in Visual Studio? It'll help me focus on what to learn and help me develop better habits. I'll just leave a link to this SO answer here. VI means never ever having to take you fingers off the keyboard. Edit a file on a Solaris machine that only allows SSH access. Note that I don't use Visual Studio, and know little about the available features in it. The following are examples of what I find useful in Vim, not a list of missing features in Visual Studio. Now we want to envelop each line in a print(""); statement. See :help complex-repeat for more info on Vim macros. Note that this is one of the improvements Vim has over the traditional Vi. If it doesn't work, you're probably running in Vi compatibility mode; use :set nocompatible to enable the full functionality of Vim. Now we want to delete everything between <i> and </i>. This can be done by simply typing the command dit (d'elete i'nner t'ag)! Or if we want to include the tags themselves in our selection, use dat (d'elete a t'ag). To delete everything inside the <b> tags, use d2it (d'elete two i'nner t'ags). You can similarly use daw (delete a word), dap (delete a paragraph), di" (delete inside double-quotes), etc; see :help text-objects for the complete list. v toggles visual mode. This makes it easier to see what you're selecting, and lets you adjust your selection with a series of multiple motions before you execute a command. In other words, that command would copy two paragraphs from your text to the system clipboard (e.g. for pasting them here at StackOverflow). :global/test/substitute/^/#/ or :g/test/s/^/#/ would search for lines containing the phrase test, and comment them out by substituting the regexp anchor ^ (beginning-of-line) with the symbol #. Good luck and have fun learning Vim! 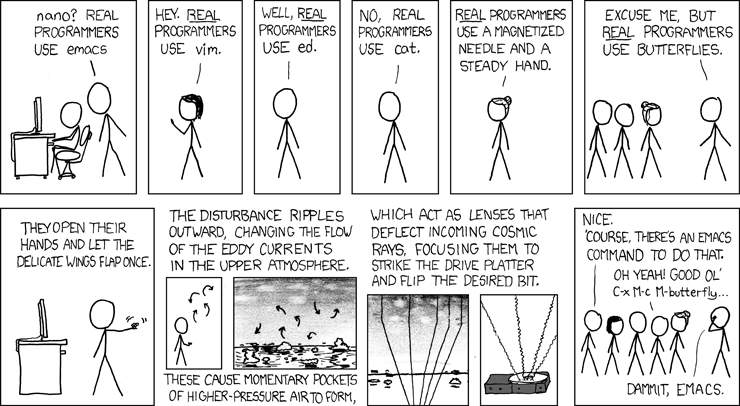 It has some great examples on Vim's power. Visual Studio's regular expressions are a little bit Mickey Mouse. Vim has the full POSIX regular expression language at your fingertips. As far as I can tell (in Visual C# express 2010) ctrl-click just selects whatever word you click on. To do the same in VIM, you can combine the yank command with a movement command. So you press "y" for yank (copy) then "e" or "w" to copy to the end of the word. I suggest you watch some screencasts at http://vimcasts.org/ to get a feeling of the power of vim. You could always use the Vim emulator/add-on for Visual Studio and get some of the power of vim mixed with the features of VS. If you're already using Visual Studio, I assume you're using a .NET language, which without VS, would be much more painful to use. Vim Essentials is a nice set of slides. Personally, I got used to vi a long time ago, when we didn't have the luxury of a mouse in student's Unix terminals. Since then, I used vi/vim for everything safe for writing emails. To this day, I probably use only 1/20 of the commands, but never felt the need to write code with another text editor, and reaching for a mouse in an IDE feels very clumsy to me. Not having to move and point with the mouse when coding (safe for using the browser) also helps preventing Carpal tunnel syndrome. Edit documents over SSH. Vim's really nice for that. teco is your answer. You only need a PDP-10 and an ASR-33 and you're on your way! Not the answer you're looking for? Browse other questions tagged visual-studio vim vi or ask your own question.